The Facade pattern is a software design pattern which is often used in object oriented programming. A facade is, in fact, a class wrapping a complex library to provide a simpler and more readable interface to it. The Facade pattern can also be used to provide a unified and well-designed API to a group of complex and poorly designed APIs. The Laravel framework has a feature similar to this pattern, also termed Facades. In this tutorial we will learn how to bring Laravel’s “Facades” to other frameworks. Before we continue, you need to have a basic understanding of Ioc containers. Let’s first go through the inner working parts of Laravel’s facades, and then we’ll discuss how we can adapt this feature to the other environments. A Laravel facade is a class which provides a static-like interface to services inside the container. These facades, according to the documentation, serve as a proxy for accessing the underlying implementation of the container’s services. There have been many debates in the PHP community about this naming, though. Some have argued that the term should be changed in order to avoid confusion of developers, as it doesn’t fully implement the Facade pattern. If this naming confuses you, feel free to call it whatever feels right to you, but please note that the base class that we’re going to use is called Facade in the Laravel framework. As you probably know, every service inside the container has a unique name. In a Laravel application, to access a service directly from the container, we can use the App::make() method or the app() helper function. In Laravel, all services have a facade class. These facade classes extend the base Facade class which is part of the Illuminate/Support package. The only thing that they need to implement is the getFacadeAccessor method, which returns the service name inside the container. In the above syntax, someService refers to the facade class. The methodName is in fact a method of the original service in the container. If we look at this syntax outside of the context of Laravel, it would mean that there’s a class named someService exposing a static method named methodName(), but that’s not how Laravel implements this interface. In the next section, we’ll see how Laravel’s base Facade class works behind the scenes. The Facade class has a private property named $app which stores a reference to the service container. If we need to use facades outside of Laravel, we have to explicitly set the container using setFacadeApplication() method. We’ll get to that shortly. Inside the base facade class, the __callStatic magic method has been implemented to handle calling of static methods which don’t actually exist. When we call a static method against a Laravel facade class, the __callStatic method is invoked, because the facade class hasn’t implemented that method. Consequently, __callStatic fetches the respective service from the container and calls the method against it. In the above method, getFacadeRoot() gets the service from the container. Each facade class extends the base class. The only thing that we need to implement is the getFacadeAccessor() method. This method does nothing but return the service’s name in the container. However, we have to do this in each and every script where we need that particular facade class. Laravel handles the aliasing of facades in its own way by using an alias loader. All alias names are kept in an aliases array inside the app.php config file, which is located inside the /config directory. Okay, now let’s see how Laravel uses this array for aliasing the facade classes. In the bootstrapping phase, Laravel uses a service named AliasLoader which is part of the Illuminate\Foundation package. AliasLoader takes the aliases array, iterates over all the elements, and creates a queue of __autoload functions using PHP’s spl_autoload_register. Each __autoload function is responsible for creating an alias for the respective facade class by using PHP’s class_alias function. Behind the scenes, FancyName is resolved to App\Facades\SomeServiceFacade. Okay, now that we have a good understanding of the way Laravel handles its facades and aliases, we can adapt Laravel’s facade approach to other environments. In this article, we’re going to use facades in the Silex framework. However, you can adapt this feature to other frameworks as well by following the same concept. This package contains other services as well, but for now we just need its base Facade class. 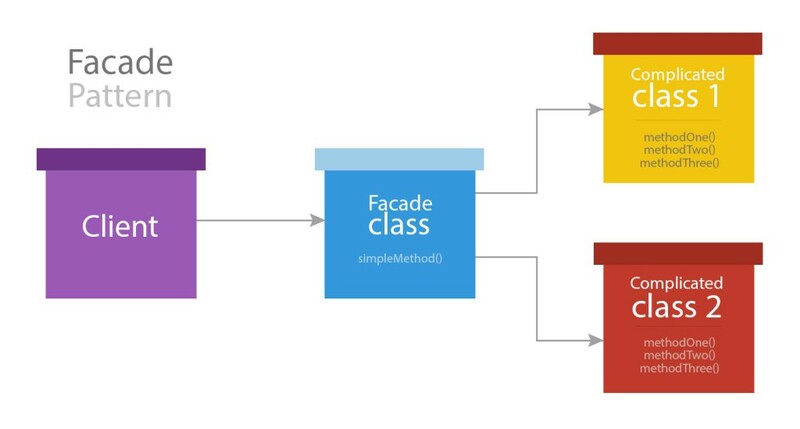 To create a facade for a service, we just need to extend the base Facade class and implement the getFacadeAccessor method. Please note that we have namespaced the class under app\facades. The only thing that remains is setting the application container on the facade class. As pointed out earlier, when we call a method in a static context against a facade class, __callStatic is triggered. _callStatic uses data returned by getFacadeAccessor() to identify the service inside the container and tries to fetch it. When we’re using the base Facade class outside of Laravel, the container object isn’t set automatically, so we will need to do this manually. To do this, the base facade class exposes a method named setFacadeApplication which sets the application container for that facade class. This will set the container for all the facades which are extending the base facade class. Now, instead of accessing the service from our container, we can use the facade class we just created, also allowing us to call all methods in a static context. To alias the facade classes, we’re going to use the AliasLoader that we introduced earlier. Aliasloader is part of the illuminate\foundation package. We can either download the whole package or just borrow the code and keep it as a file. If you just want to copy the source file, I suggest you keep it under src/Facades. You can namespace the AliasLoader class based on your project’s architecture. For this example, let’s copy the code and namespace it under app/facades. FancyName is a name that we want to use instead of App\Facades\SomeService. AliasLoader is a singleton service. To create or get the alias loader’s instance, we need to call the getInstance method with the array of aliases as an argument. Finally, to register all the aliases, we need to call its register method. A Facade class only needs to implement the getFacadeAccessor method which returns the service name inside the container. Since we’re using this feature outside of the Laravel environment, we have to explicitly set the service container using the setFacadeApplication() method. To refer to the facade classes, we either have to use the fully-qualified class names or import them with PHP’s use directive. Alternatively, we can follow Laravel’s way of aliasing the facades by using an alias loader. Questions? Comments? Leave them below! Thanks for reading!